For Freightliner truck owners and operators in the San Antonio area, Tri-County Diesel Service offers quality workmanship with confidence and integrity. Whether we're providing ongoing fleet service or an isolated mobile repair, our goal is to meet and exceed customer expectations. Our technicians receive continuous training to stay on the cutting edge of advancements in Freightliner truck manufacturing, while simultaneously working to keep the trucks we service on the road as long as possible. We realize that in the San Antonio area you have choices when it comes to selecting a truck repair and maintenance facility for your Freightliner truck. One of the first ways to sort through your options is to separate the dealerships from the independent truck shops. 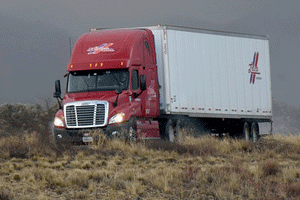 As a local truck shop, we work hard to compete with the Freightliner truck dealerships in San Antonio. To do this, we strive for consistently stellar results, quick turnaround, excellent value, and 100% customer satisfaction. After all, we're the underdog, and we've got to work that much harder to prove our worth. Freightliner truck drivers in the San Antonio area, call us to learn more about our truck repair services. Or you can contact us online, and we'll let you know how we can take care of all your maintenance and repair needs!